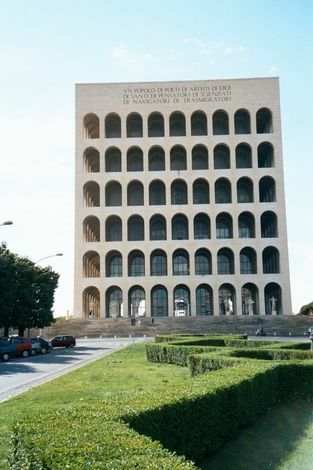 Rome under Mussolini experimented with modernity. A couple of generations later, Romans decided that the past had won but that defeat wasn't such a bad deal. The past in fact would be the city's ticket to the future. 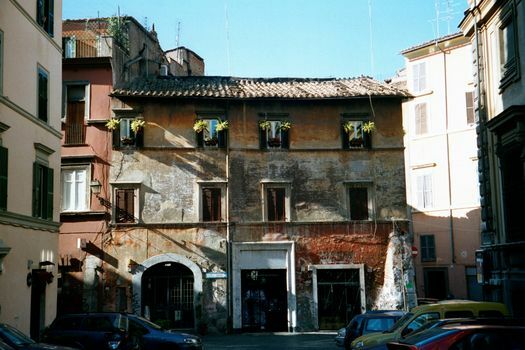 Rome began growing rapidly in the 19th century, but its new buildings, here off Via Ottaviano, were budget versions of Renaissance palaces. Fifty years later, Italian architects tried to build something modern. A good example of their failure is the city's central railway station, from the 1920s, which looks like a factory-stamped Roman aqueduct. Three miles south of the Colosseum, Rome seemed in 1942 to have finally broken free of the past. 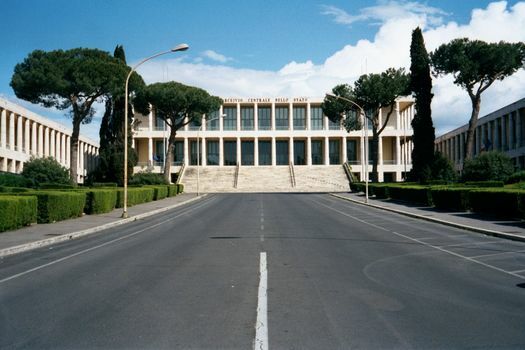 Here are the state archives, built as part of the Esposizione Universale di Roma, EUR for short, designed by Marcello Piacentini for an abortive world's fair of that year. The break with the past was not so complete. 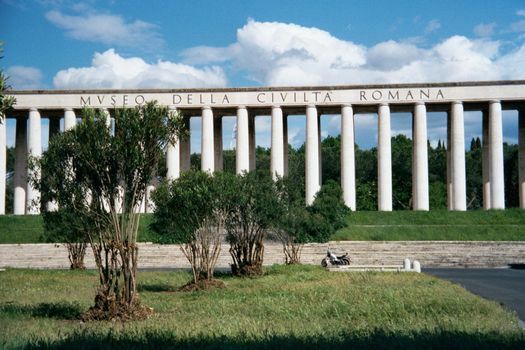 Here is the massive colonnade of the nearby Museum of Roman Civilization. Inside: a reminder of past glory. 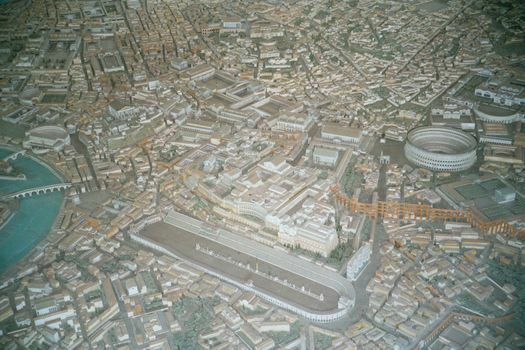 A model of classical Rome with the Circus Maximus, the Colosseum, and the fora to its left. 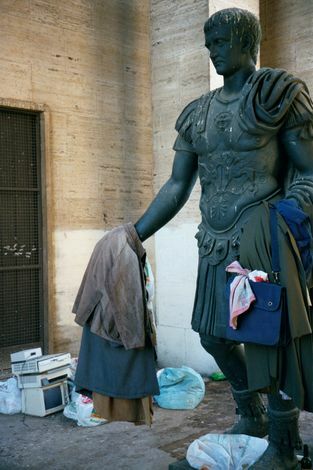 In a corner, Augustus Vendor is reduced to selling used clothes and computer bits. 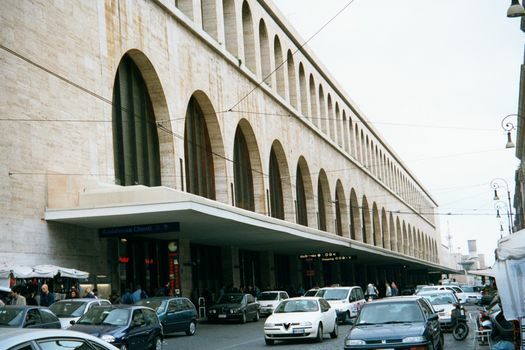 Perhaps the most famous building in the neighborhood is the Palazzo della Civilta Italiana (1938-42), now the Pallazzo della Civilta del Lavoro. Those old aqueducts were burned into the Italian mind as ineradicably as the symmetry of the Forbidden City is etched in China's. Amazing that with all those talents engineering doesn't make the cut. 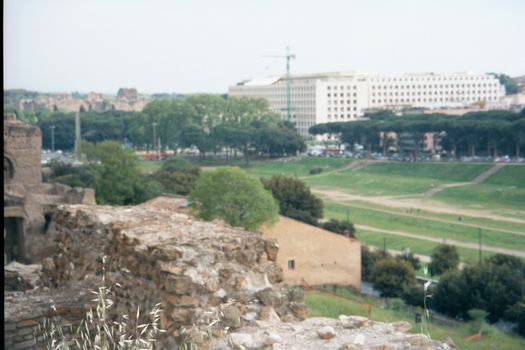 We're atop the Palatine and overlooking the Circus Maximus. Beyond it: a building that did escape the past better than many others. It's from 1938 and was built to house the Ministry of African Colonies. Since 1951, the building has served as the headquarters of the U.N.'s Food and Agriculture Organization. To its left, and standing out against the trees, is the Stele of Axum, taken from one of those colonies in 1937. The stele was carved about 300 A.D.
Closer still. 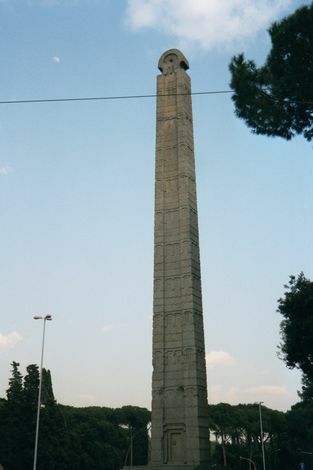 After promising Ethiopia as early as 1947 that the stele would be returned, the authorities took action in May, 2004. The stele was sliced in three, packed in boxes, and sent to Fiumicino airport. 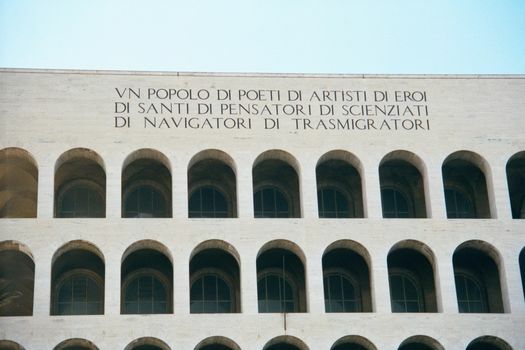 Vittorio Sgarbi, an art critic and deputy minister for culture in the Berlusconi government, explained to a reporter that "Ethiopia was part of Italy at the time, so the obelisk can't have been stolen, can it?" Then why return it? His reply: "we are only giving it back to them because they are pathetic paupers." 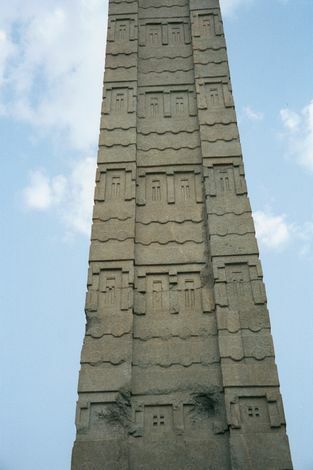 In April, 2005 the stele arrived at Axum. Ethiopia's Culture Minister Teshome Toga said, "This is a very historical moment for us, we have waited so long to have the obelisk back," he said. The BBC also quoted Abebe Alenayehu, 81, who had watched Italian troops take the obelisk and who said he never expected to see its return. "The memory still leaves a bitter taste in my mouth," he told the Associated Press news agency. "Every day for the last 67 years I have thought about the obelisk." 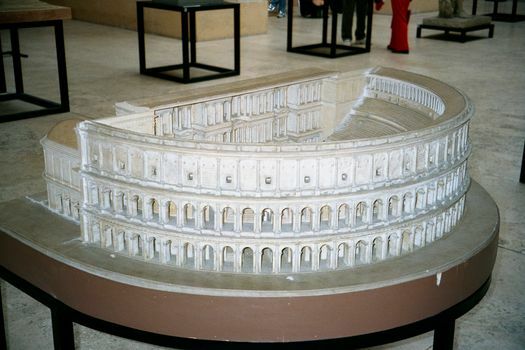 Rome was equally bound to its past, in no small part because preservation proved profitable. 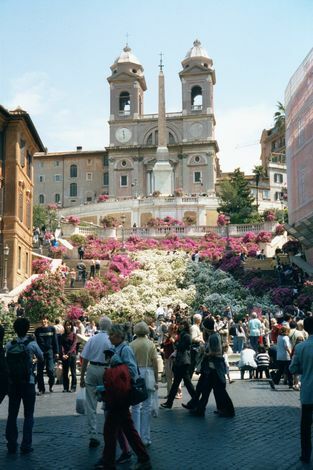 Here's Tourist Central, the Spanish Steps. 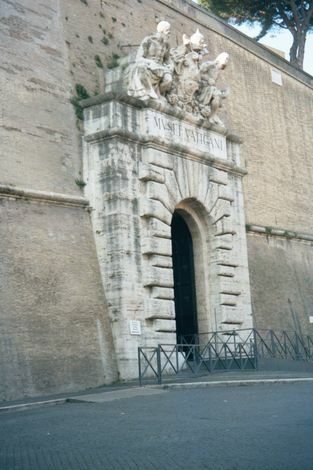 Descending from the church of the Trinita dei Monti, the steps were built in the 1720s at the expense, ironically, of the French ambassador. The name comes from the Spanish embassy, which has been nearby since the 17th century. Once Lord Byron was its neighbor; now the neighbors are American Express and Hugo Boss. 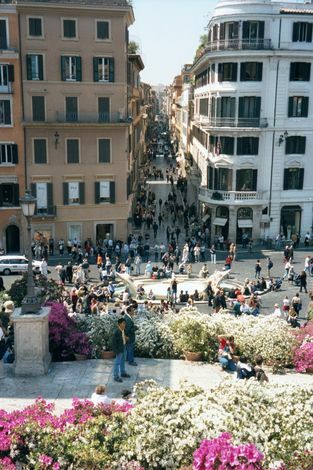 Looking down the steps toward the stylish Via Condotti. 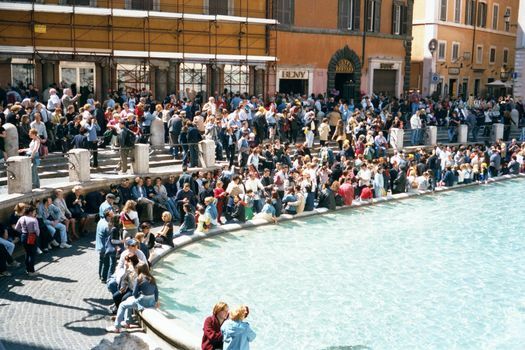 A few blocks away, crowds at the Trevi Fountain wait for something. 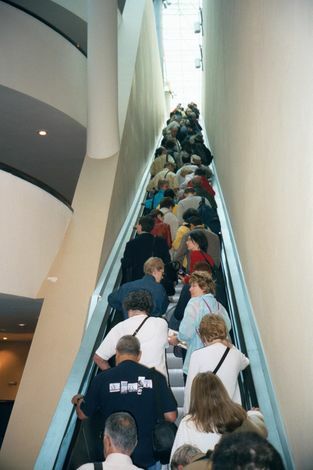 Anita and Marcello don't show up, so the crowd heads for--no joke--the Vatican museum. The exit looks more like what you expected. 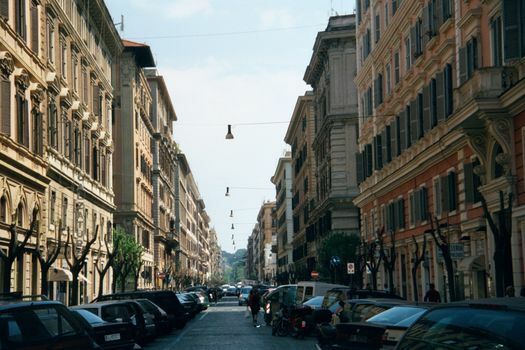 So Rome depends on its past, sometimes grand but sometimes as simple as the Via de Tre Archi, near the Piazza Navona. 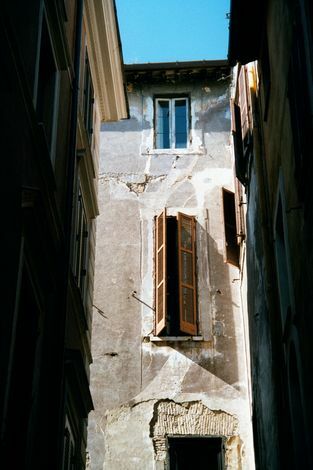 A house on the Piazza del Gesu, off Corso Vittorio Emmanuel.